Imagine, if you will, that you’re shopping at your local food market. You stroll through the narrow aisles and inspect the produce, looking carefully for the plumpest tomatoes or the cleanest lettuce. You approach a vendor and ask the price of a small bunch of eggplants that caught your eye. She quickly and forcefully replies, “Cinq mille!” You pause and roll your eyes back to concentrate on remembering how to count in French. A few seconds later, you confidently conclude that cinq mille is five thousand. The next question, which usually only complicates matters, is to clarify if that price is quoted in francs or ariary. You suspect that the price is in francs, the former currency of Madagascar, so you mentally try to convert the price to ariary in order to put things in a perspective that you can more easily understand. The standard conversion is 5 francs to 1 ariary. You then fumble through the local language to ask the vendor if she really means to say the eggplants are arivo ariary (1,000 ariary) and she just blankly stares back at you. Maybe she also pauses to roll her eyes back. You see that she’s having just as much trouble converting ariary back to francs in her head as you did a few moments earlier! With a big smile and nod of her head, she confirms that you two are both on the same page. 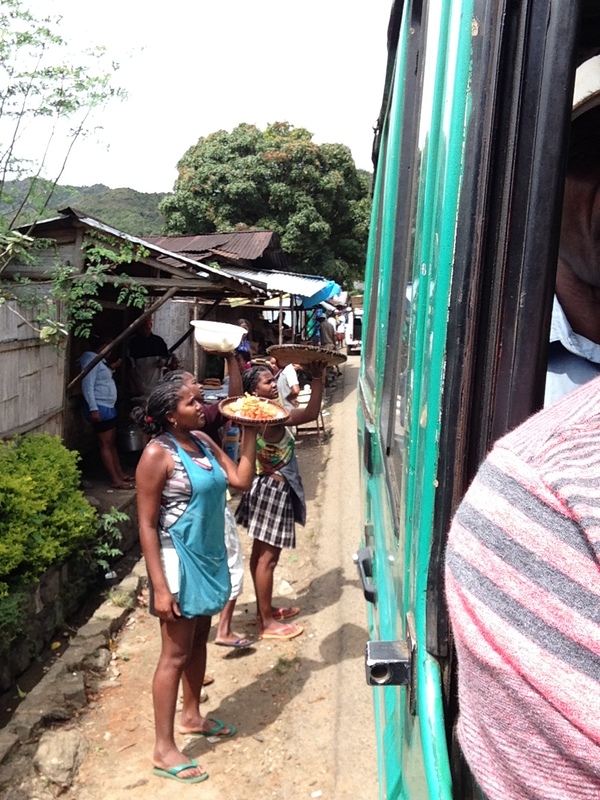 You hand her a crumpled and worn out purple bank note, she gives you the eggplants, and with an emphatic “misaotra betseka” (thank you very much) for her patience and help, you move on to the next stall and repeat the exercise again with the man selling onions. This scenario is a prime example of about half the interactions I have when I go food shopping in Madagascar. The root of the confusion is the currency. 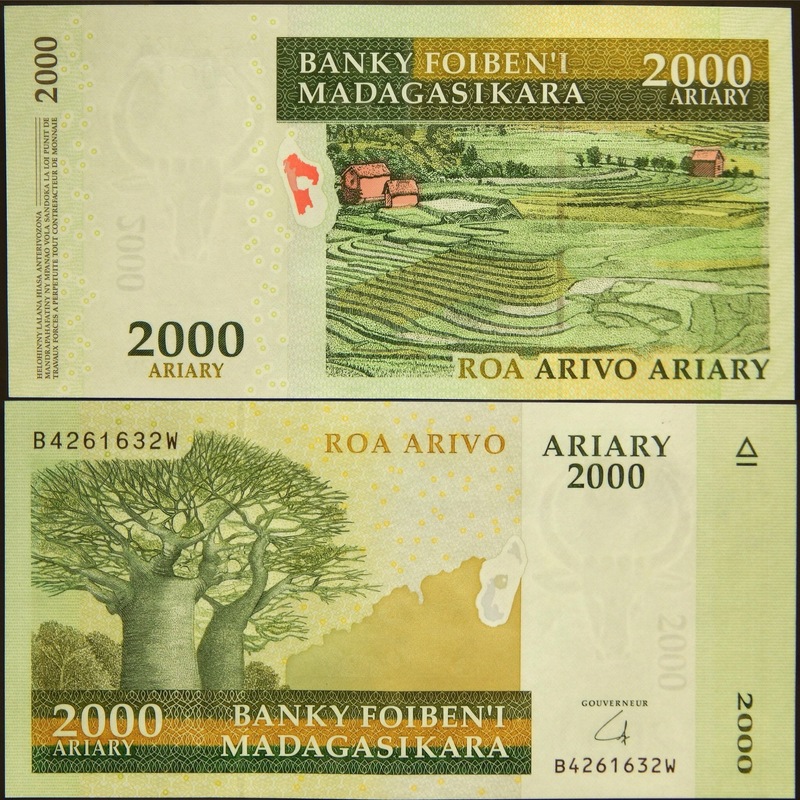 Officially, the ariary is the sole currency of Madagascar. 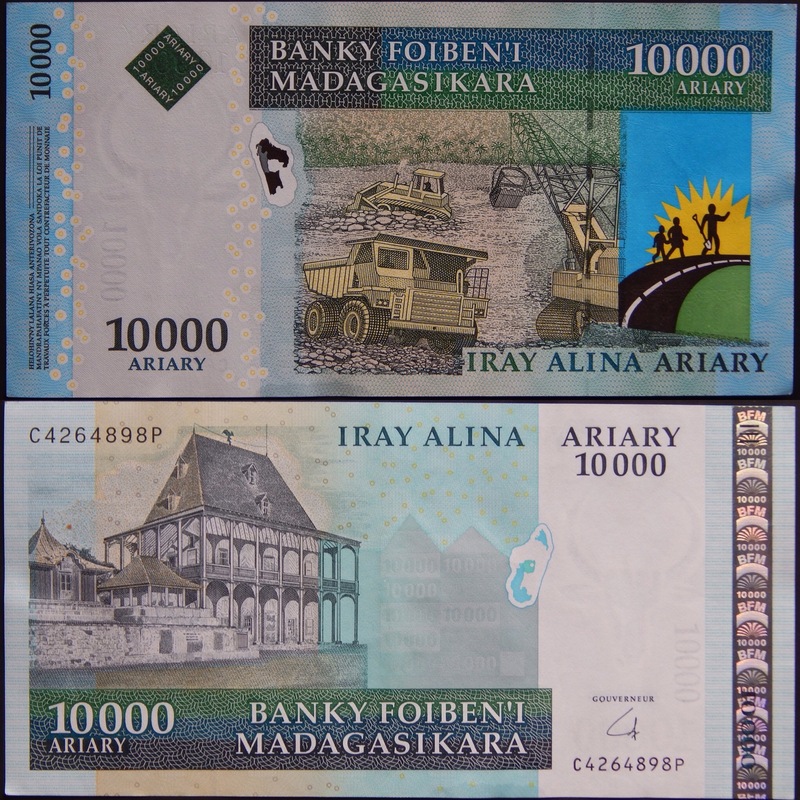 It replaced the Malagasy franc, a relic left over from French colonization, in January 2005. 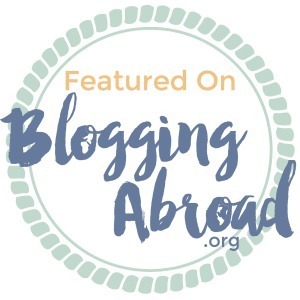 For various reasons, many people have held on to the idea of the franc in terms of both financial worth and the French numbers that come along with it. In the part of Madagascar where I live, there is still a strong French vazaha (foreigner) influence and most people mistake me for being French simply because of my appearance. When I buy things, most people make that assumption and give me the price of items in francs and they say it using French numbers. Delightful for someone like me who hates doing math in his head and doesn’t speak French very well. 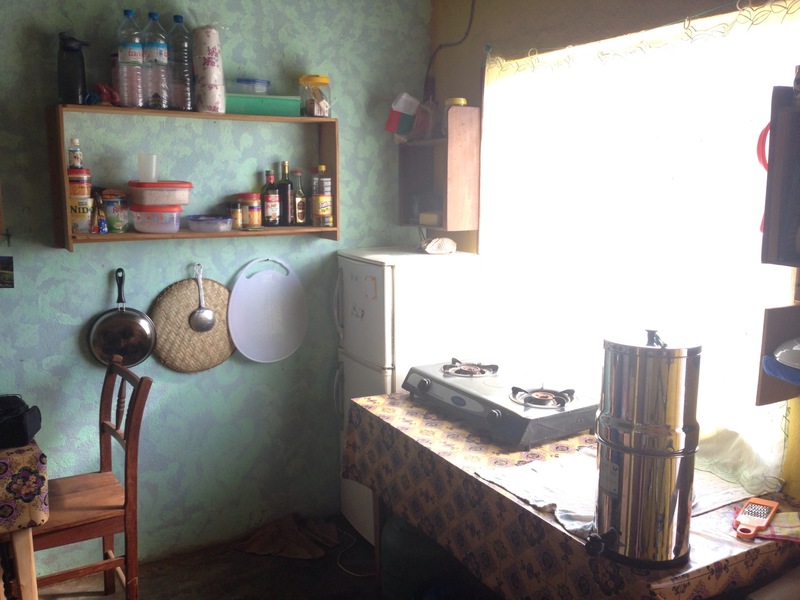 But I usually manage to turn the tables by using Malagasy to ask for the price in ariary and most people get a kick out of seeing a tall white guy like me haggling in Malagasy for a good price on a kilo of carrots. I will not be taken advantage of at the market! In order to share a part of Malagasy culture that I come in contact with on a daily basis, I would like to present a brief summary and description of the money used in this country. The photos are of actual bank notes that have been in my possession and they are without a doubt the cleanest that they will ever be in these pictures. 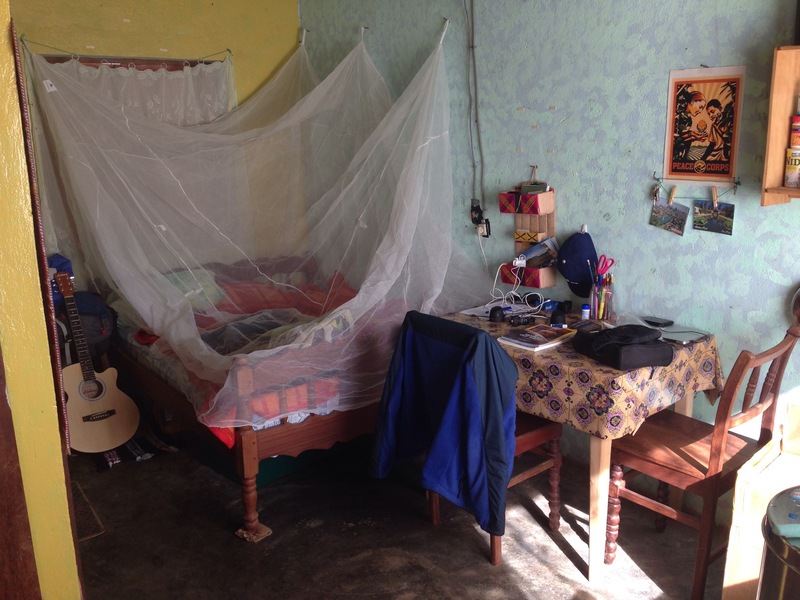 It’s hard to keep an ariary clean for a long time in Madagascar. At the time this post is being written, 1 US dollar is equivalent to about 3300 ariary. 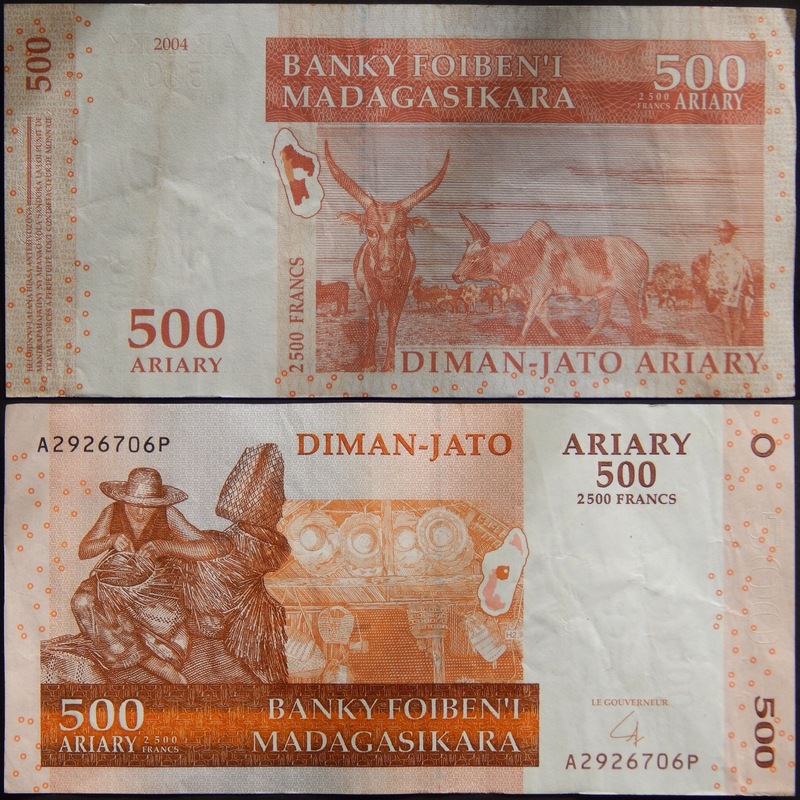 The conversion rate between Malagasy francs and ariary does not change; it remains constant at 5 francs to 1 ariary. On one side of the bill is an image of Antsiranana Bay with it’s iconic island jutting out from the water. The bay is located near the very northern tip of the country and is considered one of the finest natural harbors in the world. It protects the city of Antsiranana (also known by it’s French colonial name Diego-Suarez) from the Indian Ocean. 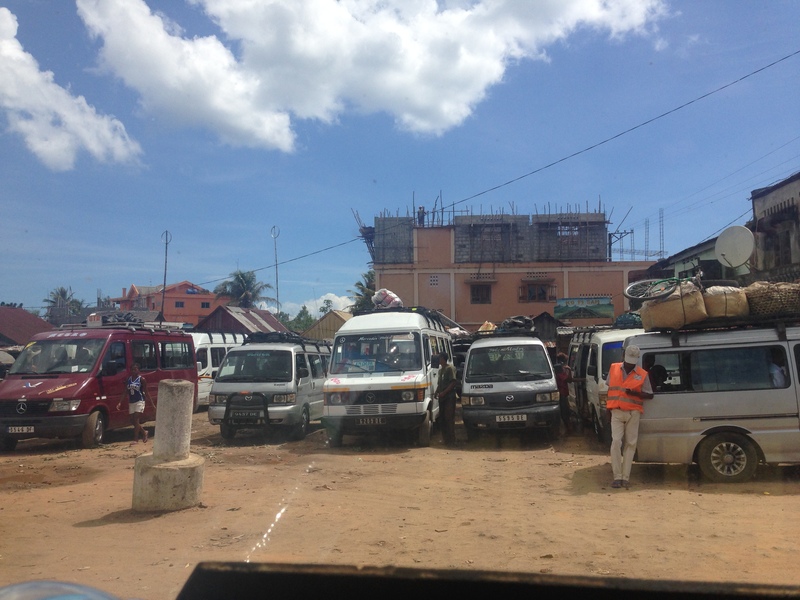 Today, Antsiranana is a popular destination for foreign tourists and French ex-pats looking to retire in Madagascar. 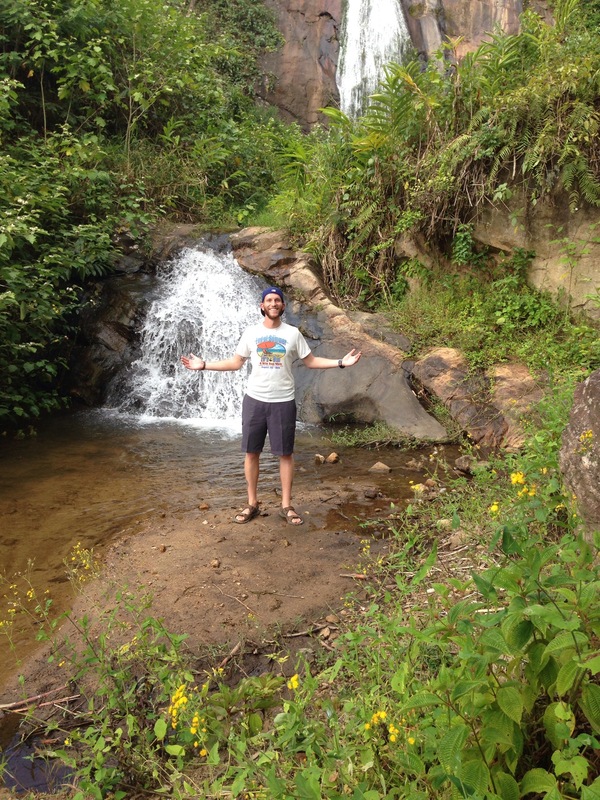 On the opposite side are two images of the natural wonders found in Madagascar. First, the famous ravinala tree found on the island. It is commonly know as the “traveler’s palm” because the various parts of the tree can be used to assist a wandering traveler. For example, the broad leaves make for an effective umbrella during a sudden rainstorm or they can be thatched together to make a roof for a house. Also, there is often water stored in the base of each leaf that can be used as an emergency source of drinking water. And behind the ravinala tree is an image of a karst limestone formation frequently found in Tsingy de Bemaraha Strict Nature Reserve. The area was designated as a UNESCO World Heritage Site in 1990 because of the unique geography, preserved mangrove forests, and wild bird and lemur populations. This is the smallest denomination of paper money in Madagascar. Smaller denominations do exist in the form of coins, but those are almost never used in circulation. With 100 ariary, I can easily buy one small piece of fried dough or one decent-sized tomato. 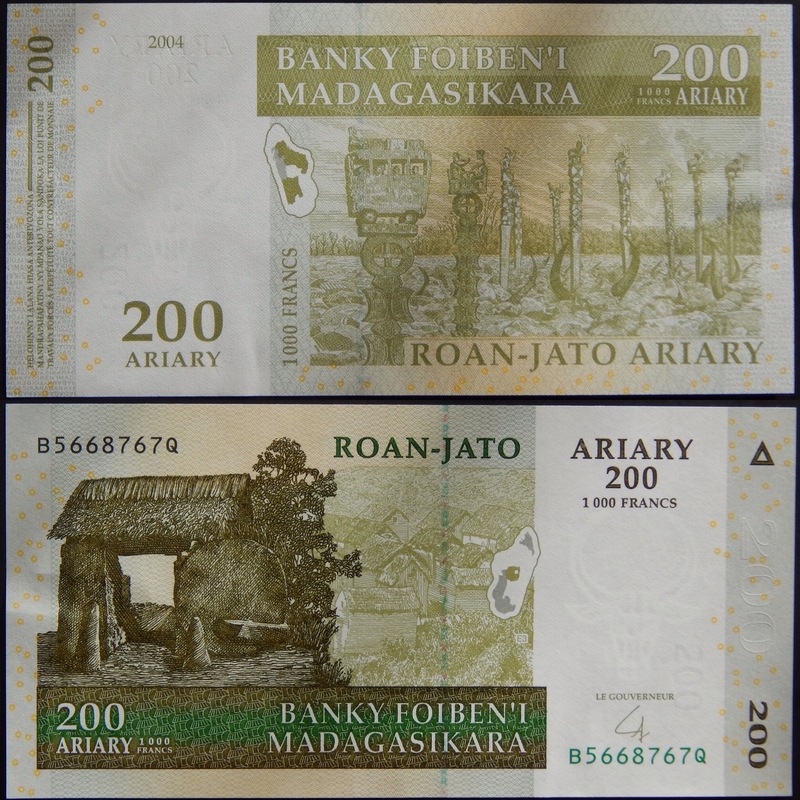 The 200 ariary bill features an image of various styles of aloalo, which are intricately carved wooden poles placed on the graves of prominent people. These funerary sculptures, along with the skulls and horns of slaughtered zebu, often tell a story about the person’s life and why they were important to the community. 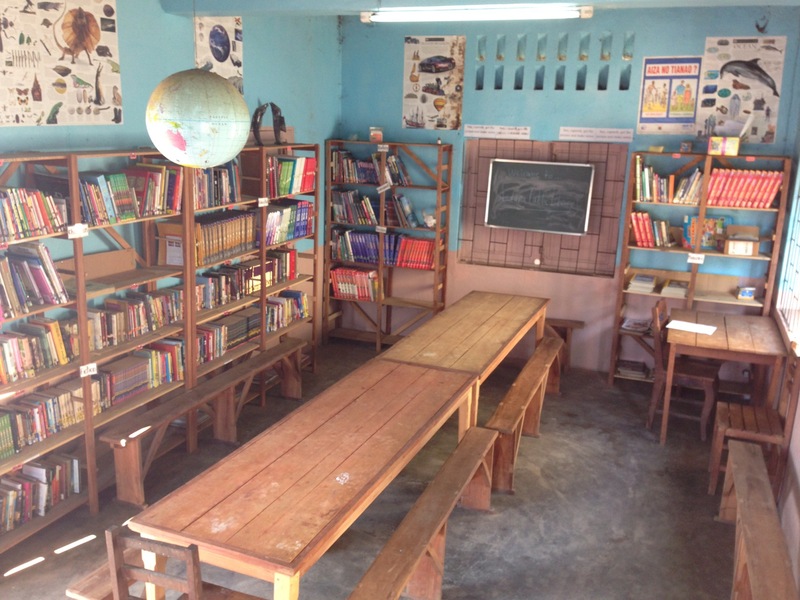 This is a practice done primarily in the south-west regions of Madagascar, especially by the Mahafaly people. On the reverse side of the 200 ariary note is a depiction of one of the large stone gates that were used to protect many villages in the central Highlands. The entryway to the village could be sealed each night by a huge stone disk, called a vavahady, and reopened again in the mornings. The practice of building fortified walls and gates in the Highlands spread quickly in the region and allowed the Merina royal families to maintain their positions of power until French colonization in the late 1800’s. With 200 ariary, I can buy 3-4 small tomatoes, three large bananas, or a small cup of coffee. One side of the 500 ariary bill shows a group of zebu, which are a sub-species of domestic cattle that originate in South Asia. The breed is extremely resistant to high temperatures and commonly found in tropical countries. The zebu’s defining characteristic is a large fatty hump on the shoulders. In Madagascar, zebu are almost exclusively farmed as work animals in agriculture and for beef. When beef is served in Madagascar, it is almost always meat from the zebu. The animal is so well integrated into Malagasy culture that it is prominently featured on the country’s official seal. On the other side of the bill, a Malagasy artisan is seen weaving a traditional basket. The material, known as tsihy, is a natural fiber that can be used to create all types of items. The most common types of items made are hats, bags, baskets, and floor mats. 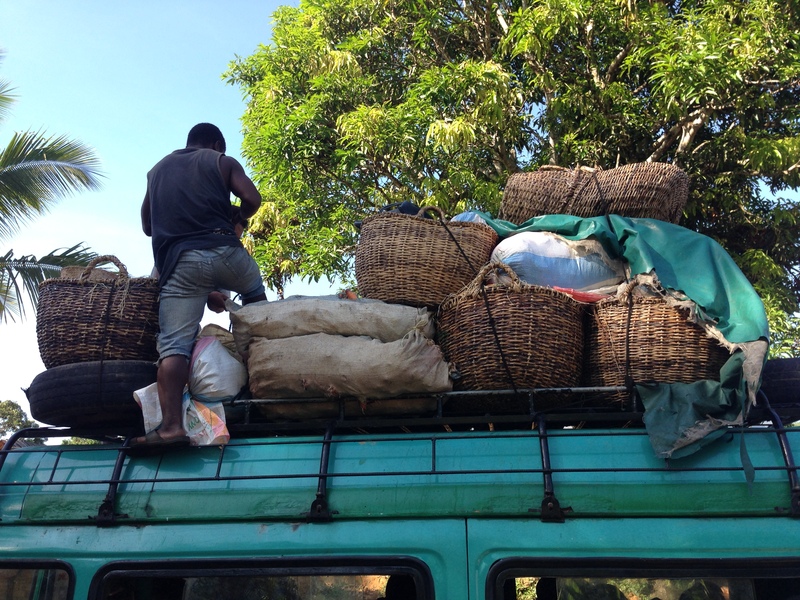 Malagasy people all over the island use this material in their everyday life. 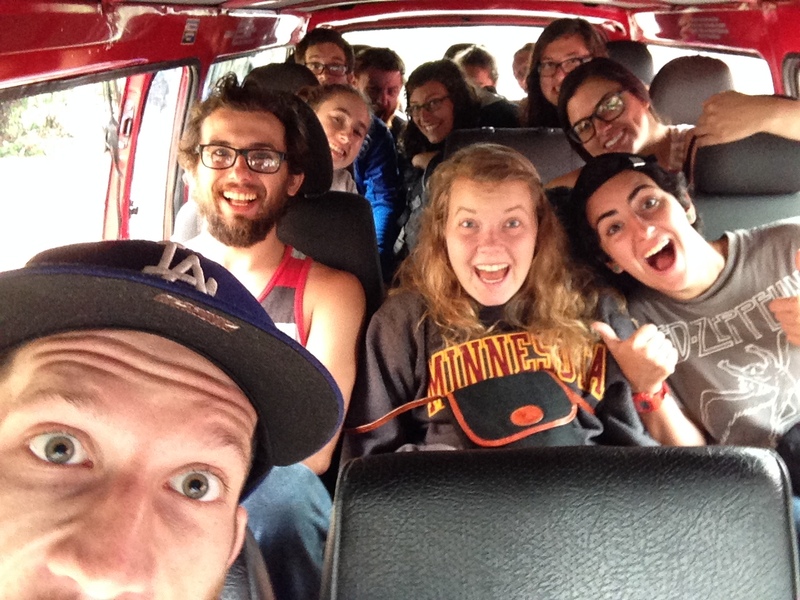 With 500 ariary, I can buy a cup of dry beans, two small bars of soap, or sometimes I can get a one-way taxi ride in the larger cities. 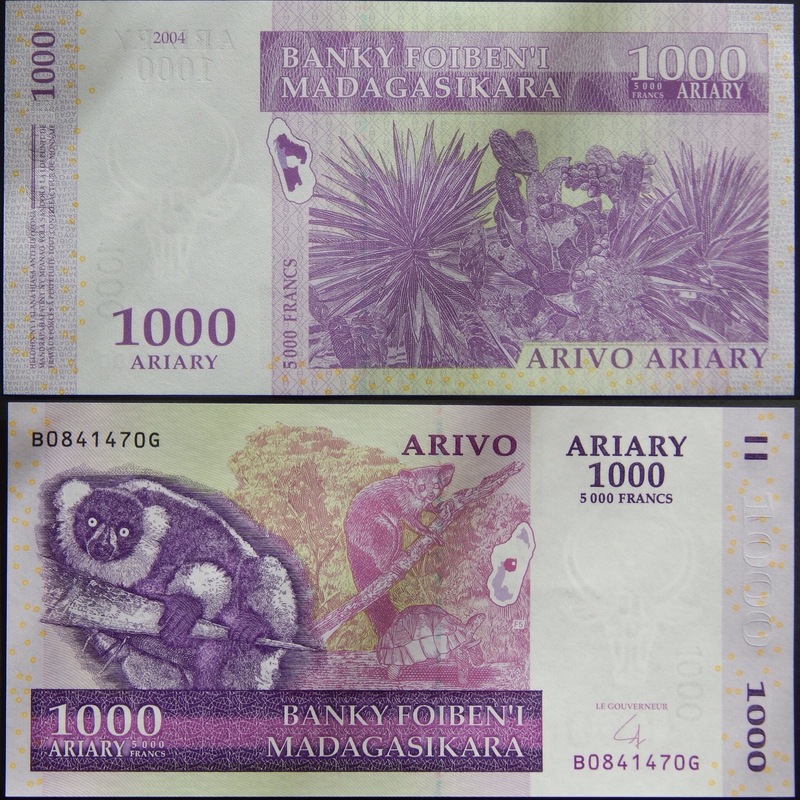 The 1000 ariary note celebrates the unique flora and fauna of Madagascar. On one side, the sword-shaped leaves of the sisal plant are seen together with cactus. Sisal is a species of agave plants and is widely used for it’s strong natural fibers. Both the sisal and cactus represent the dry desert areas of Madagascar. On the reverse, two species of gidrö (lemur) are proudly displayed along with a turtle. Madagascar is considered to be a biodiversity hotspot because approximately 90% of all plant and animal species on the island are endemic. Lemurs are arguably the most famous animals from Madagascar and there are more than 100 species of lemurs. With 1000 ariary, I can buy two eggs, two baguette-style loaves of bread, or a small glass of natural fruit juice. On the 2000 ariary note, a typical landscape of terraced rice fields is depicted. Rice is a staple food in Madagascar and typically eaten at every meal of the day. For most Malagasy people, rice is the primary focus of the meal and any meat or vegetable dishes are considered to be side dishes eaten in smaller quantities. Madagascar is among the top 20 rice producing countries in the world. On the reverse side of the bill, the mighty baobab tree is shown. The baobab is endemic to Madagascar and there are six species on the island. The tree is another one of Madagascar’s popular icons. In some parts of the country, baobab trees are greatly revered and seen as a link between the living and their tribal ancestors. With 2000 ariary, I can buy a plate of rice and side dish at a local Malagasy restaurant or a half kilogram of onions. 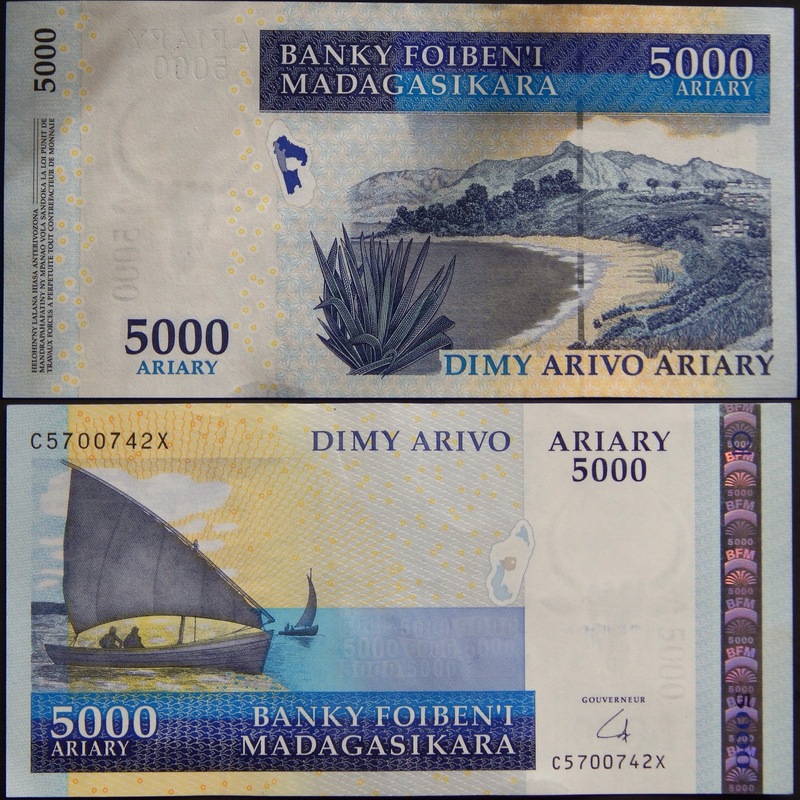 The 5000 ariary bill is designed with a scenic beach view from the southern coast of the island. 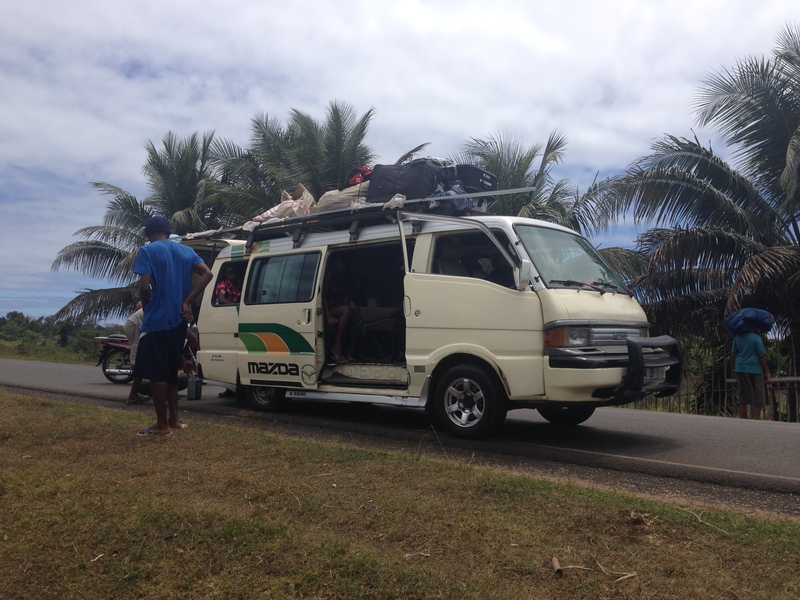 The location is near the town of Fort Dauphin, which is another very popular tourist destination. 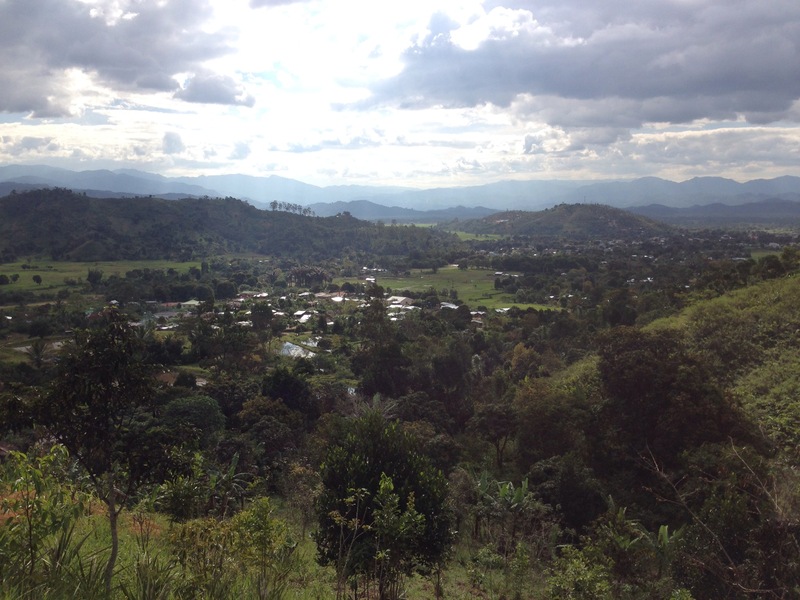 It gracefully shows the complexity of the Malagasy landscape, from beaches to mountains and a variety of plants. Continuing with this oceanic theme, the other side of the bill shows a traditional Malagasy boat. The style of boat, general known as a “dhow”, is believed to have roots in the Indian culture. Because the Malagasy people come from a mixture of Indian and Micronesian decent, this style of vessel has been a part of Malagasy tradition for many generations. In many coastal parts of the island, fishermen still use these boats to sail out to sea. With 5000 ariary, I can buy two beers, enough telephone credit to last me for about a week, or a decent shirt at one of the many secondhand clothing markets. 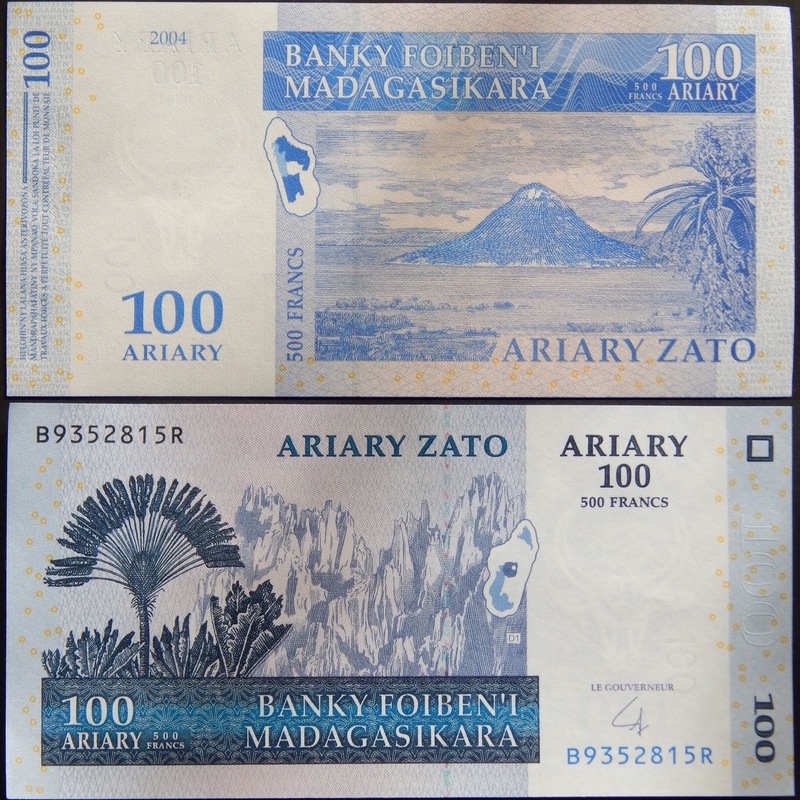 On the 10000 ariary bill, the past and present are brought together to celebrate the progress of Malagasy society. First, a scene of road construction is pictured. 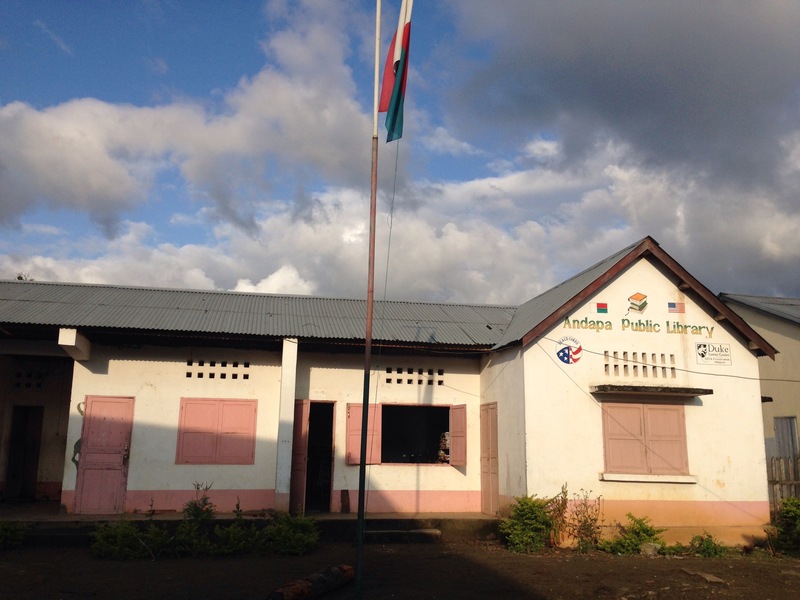 As with many developing countries in the world, the current infrastructure of Madagascar is a constant project of national concern. 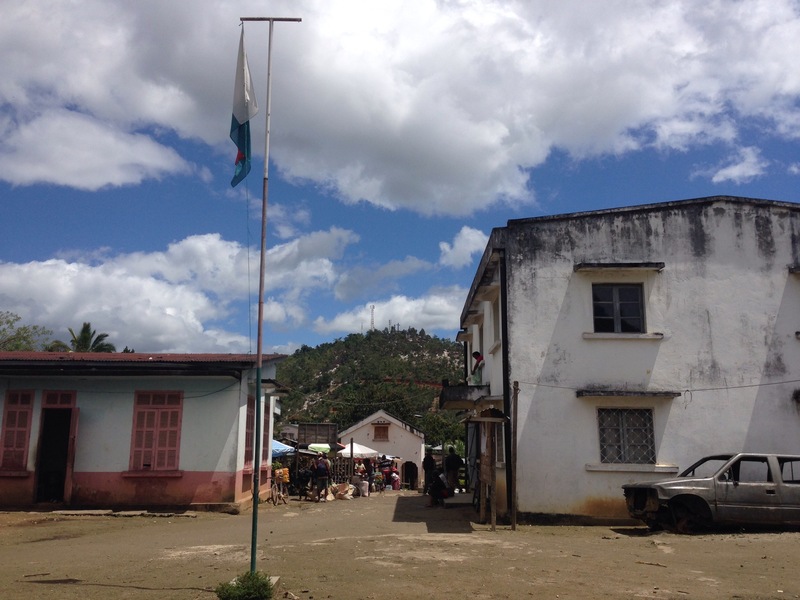 Between building and maintaining roads, schools, hospitals, and other social services, the Malagasy people have their collective plate very full. 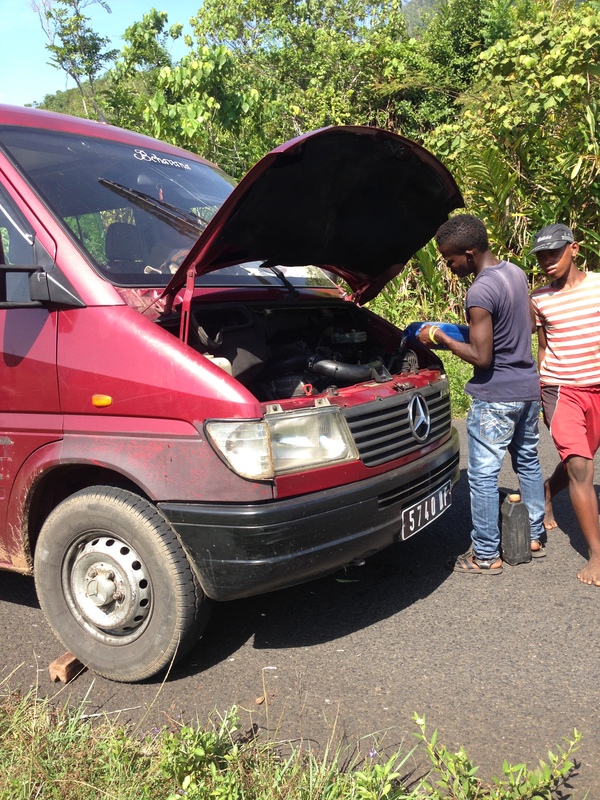 Without getting into any of the politics surrounding infrastructure development, it’s fair to say that some places on the island are more developed than others and many of the Malagasy people I’ve talked to have lamented about how this road or that power plant could be better. In general, however, people seem to be hopeful about the future development plans of this island nation. Secondly, the other side of the bill is a reminder of the former Kingdom of Madagascar. Between the 17th and 19th centuries, the seat of power in the kingdom was in the central highland city of Antananarivo (also the current national capitol). The Rova (royal palace complex) has been the home of several kings and queens and it sits on top of one of the highest points in the region. The building depicted on the currency is known as the Queen’s Palace, which is part of the greater Rova. The original palace, as seen on the bill, was built by French colonial officials for Queen Ranavalona I around 1840 and then it was reinforced with a stone casing in 1867. In 1995, a fire destroyed most of the buildings in the Rova, including the original wooden structure of the Queen’s Palace. Today, only the stone casing remains and it is still prominently displayed as part of the growing skyline of Antananarivo. With 10000 ariary, I can buy an unusually nice meal at a “fancy” restaurant or a live chicken in the market.